The Environmental Protection Agency looks to her as a founding inspiration and the Fish & Wildlife Service as a source of agency pride. The EPA's official history site states: "There is no question...that SILENT SPRING prompted the Federal Government to take action against water and air pollution  as well as against the misuse of pesticides  several years before it otherwise might have moved." 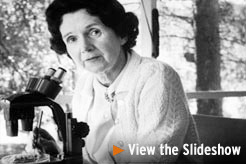 But the common view of Rachel Carson's impact goes far beyond government bureaucracy. Carson and her most famous book, SILENT SPRING, are credited with no less than inspiring the modern global environmental movement. In its collection of the 100 most important people of the 20th Century, TIME magazine said: "Before there was an environmental movement, there was one brave woman and her very brave book." In 2007, the centenary of Carson's birth is being celebrated around the world  and her work is still making waves  just as it did in 1962. Rachel Carson was born in 1907 in Springdale, Pennsylvania. Carson was always interested in writing  contributing a number of stories to the children's magazine ST. NICHOLAS. She also had a long-standing love of nature. In a speech to the society of women journalists, Theta Sigma Pi, in 1954 she said: "I was rather a solitary child and spent a great deal of time in woods and beside streams, learning the birds and insects and flowers." Carson attended the Pennsylvania College for Women at Pittsburgh. Originally intending on majoring in English composition, Carson changed her focus to biology and went on to study at the Woods Hole Marine Biological Laboratory, and received her MA in zoology from Johns Hopkins University in 1932. Carson went on to a position as aquatic biologist with the Bureau of Fisheries in Washington (subsequently the Fish & Wildlife Service). Both a writer and biologist  Carson started out creating radio scripts  her series was called "The Romance of the Seas." She stayed with the U. S. Fish & Wildlife Service for fifteen years, finishing her career as Editor-in-Chief of all publications for the Service. Encouraged by friends and colleagues, Carson submitted articles for publication  "Undersea" was published in 1937 by ATLANTIC. 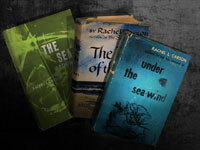 Carson followed with three books about the sea: 1941's UNDER THE SEA WIND, best-selling THE SEA AROUND US in 1951, and THE EDGE OF THE SEA, 1955  all of which were lauded for her ability to write eloquently and clearly about science for a mainstream audience. THE SEA AROUND US won numerous awards including the Gold Medal of the New York Zoological Society, the John Burroughs Medal, the Gold Medal of the Geographical Society of Philadelphia and the National Book Award  and was a best-seller. The success of THE SEA AROUND US enabled Carson to retire from government service. She turned her attention to documenting the effects of pesticides on the environment. As she noted in "Essay on the Biological Sciences" in GOOD READING  from 1958 the notion of ecology and the idea that some wondrous new technologies may come with destructive side effects were new. THE NEW YORK TIMES covered the furor in "'Silent Spring' is Now Noisy Summer: Pesticides Industry Up In Arms Over a New Book": "The $300,000,000 pesticides industry has been highly irritated by a quiet woman author whose previous works on science have been praised for the beauty and precision of the writing." But the battle itself had put the question on the table at the highest level. Specifically citing SILENT SPRING, the Kennedy administration ordered a study on the possible long-term effects of DDT and other pesticides. Carson herself testified in front of the Commission and Congress  and seven years later her request for a department to study man's effect on the ecology was fulfilled with the Environmental Protection Agency. It stands to reason that if her impact had not been so formidable  the backlash would not have been so great. 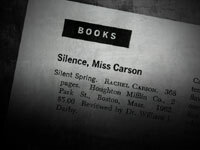 And with the 100th anniversary of Carson's birth there has been renewed attention focused on SILENT SPRING and DDT. With this centenary year too, Carson's books are all back in print, and a new generation of writers and scientists are looking to her for inspiration. The Earth Conservation Corps (ECC) The Earth Conservation Corps (ECC), a group of young adults from urban DC, works to reclaim a dying neighborhood by providing leadership tools to disadvantaged youth while cleaning up the environment. E.O. Wilson: Bill Moyers talks about the future of our planet with noted entomologist and father of sociobiology, E.O. Wilson. This site, created with materials from Carson biographer Linda Lear, holds a wealth of pictures, writings, an extensive bibliography and a list of centenary events. The Homestead Society was formed in 1975 to preserve and restore this National Register historic site and to offer education programs which advance Rachel Carson's environmental ethic. The site also hosts a list of 2007 events and has resources for teachers. "In the 100th anniversary year of Carson's birth, this publication examines how occasionally in history a book with a powerful idea can bring about peaceful but dramatic change in a democratic society." The U.S. Department of State has created an extensive site about Carson and her legacy  including a photo essay. The material also comes in PDF format for printing. The site has an extensive collection of Carson materials. As part of their tribute to former employee Carson, Fish & Wildlife has collected some of her early writings, including the "Conservation in Action" series. Also of interest at the Fish & Wildlife site is the historical collection of press about DDT: U.S. Fish & Wildlife Service Historic Press Releases: DDT and perspectives on her legacy from current employees. This blog hosts a moderated discussion about Carson and has an ongoing online book club dedicated to re-reading Carson's works. Noted naturalist and writer Peter Matthiessen on one of the TIME 100: "Even if she had not inspired a generation of activists, Carson would prevail as one of the greatest nature writers in American letters." The Rachel Carson Institute was established at Chatham College in 1989 to continue the legacy of Chatham's most distinguished alumna. The Institute hosts national and regional conferences, debates, lecture series, seminars, panel discussions and other educational programs. "There's Poison All Around Us Now"
"'Silent Spring' is Now Noisy Summer: Pesticides Industry Up In Arms Over a New Book"
Critics allege that Carson's case against the insecticide DDT put a halt to the chemical's use to fight malaria around the world. But what is the truth? Find out more.